"The Method Taken for Preserving the Health of the Crew of His Majesty's Ship the Resolution during Her Late Voyage Round the World. 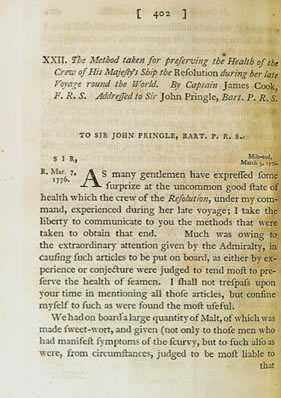 By Captain James Cook, F. R. S. Addressed to Sir John Pringle, Bart. P. R. S." Philosophical Transactions of the Royal Society of London. 1776. 66:402-406. James Cook's voyages to the South Pacific contributed greatly to European geographical and botanical knowledge of the region. On his first voyage to the area, he was accompanied by a young Joseph Banks, who would be elected President of the Royal Society. His second voyage, in which he circumnavigated the globe, was also notable for being essentially free of the ravages of scurvy – prevented by his insistence that his crew regularly consume fresh fruit and vegetables as part of their diet.